As I've alluded to in a couple previous posts, I've been seeing a wonderful girl (Audrey) for the last few months. One of our joint interest is a passion for both food and drink. She may not be as much of a nerd as I am when it comes to beer, but she certainly enjoys it (especially Belgians). As I have gotten her to geek out a bit more in return she has been getting me into running... once every couple weeks. A couple months back she invited me to go down to the Outer Banks for a long weekend with her family. I thought it would be a good idea to bring some homebrew (and homemade goat cheese) to help win them over. We decided to brew something that would go well with the seafood we were sure to eat down there. We struck upon the idea of doing a pale Belgian ale with plenty of wheat and spiced with lemon zest and black pepper. The malt bill was pretty simple, pils, wheat malt, and Munich plus a touch of cara-10 to keep it from being too dry. For hops we went for moderate bitterness with Glacier (which has some lemony aspects to its flavor). We added the spices at flameout to preserve their aroma (we went easy on the amounts knowing we could add more later). After reading the yeast descriptions she liked the sound of White Labs 550 (Belgian Ale Yeast originally from Achouffe), it is a pretty mellow yeast, and I fermented it cool to further mellow the character since we wanted it to have broad appeal. Last weekend we were down there and the beer went over well with her family (and luckily so did I). Appearance – Cloudy golden-orange (it clears as it warms indicating chill-haze). Nice two finger white head, retention is moderate at best. When it sank the head became clumpy, certainly reminiscent of the coagulated protein flakes I saw in the boil. Smell – There is a complex spice aroma with clove, citrus, pepper, and coriander. It is hard to tell what is actually from the spices and what is just yeast derived. As it warms the smell turns yeastier, like fresh dough. Taste – The flavor has similar spice notes to the nose, but it is enhanced by a solid bready malt backbone. It is a bit sweeter than I wanted, just .25 lbs of crystal may have been too much. More bitterness could also help to cut through the sweetness as well. Mouthfeel – Not as carbonated as I intended, closer to a bottled British beer (~2 volumes). As a result the body seems thicker than ideal for a moderate gravity Belgian. 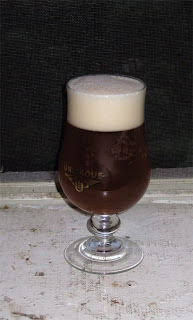 Drinkability & Notes – It is a solid beer, but it is not as dry/crisp as I was aiming for. This is partly a result of the lower carbonation, but I think the crystal malt is also partly to blame. I am happy that the spicing plays with the yeast, I don't think I would change the amounts if I brewed it again. 1.00 oz. Glacier @ 60 Min. 0.25 Tsp Yeast Nutrient 15 Min. 30 Black Peppercorns 0 Min. 2 Lemons worth of zest 0 Min. Was ready to add acid, but the mash pH was perfect. Collected 6.5 gallons of 1.042 wort. Some of the best hot break I have ever seen, huge chunks of coagulated protein in the boil. Zest of 2 lemons and 15 crushed black peppercorns added at flameout. Boiled down to 4.5 gallons, let chill for 2 hours because I fell asleep, strained, pitched the whole 1.5 qrt starter that I made the night before, and gave 60 seconds of O2. Put into the chest freezer @ 64 degrees. Strong fermentation, nearly blowing off after 12 hours. 5/04/09 Upped the temp to 70 to help the beer finish out as fermentation seems to be slowing. 5/16/09 Added another ~15 peppercorns toasted (to sanitize), and crushed. 5/28/09 Ended up with ~4.25 gallons. Bottled with 4 oz of cane sugar (aiming for the high 2's volumes CO2). May not have mixed sugar in well enough as the sample from the end of the bucket tasted very sweet. Looks very clear. Gravity down to 1.010. 5/31/09 Already a faint hint of carbonation. 6/20/09 Carbonation does seems variable (although just a bit low for the most part), I will always stir the priming sugar in more thoroughly in the future. Sounds like a great beer. I think I'll try it myself. Always wanted to try peppercorns in a beer. Curious about how far forward the pepper is -- on a scale of 1 to 10 with 10 being the level in a hot and sour soup, where would you put this beer? I would say it is just a 3 on the pepper scale. If you want to really taste it I would double the amount and/or grind it finer. If you want to try a beer that is over the top with black pepper find some Route des épices from Dieu du Ciel. After trying that I wanted to be pretty subtle. I have always carbonated my homebrew with corn sugar because glucose (a monosaccharide) does not require oxygen for the yeast to metabolize and create CO2. I think the sucrose in cane sugar (a disaccharide) does require some oxygen to metabolize, which may have contributed to your lower than expected carbonation. Yeast most certainly does not need oxygen to metabolize disaccharides (most of the fermentables in beer are in the form of maltose which is a disaccharide). Oxygen is a necessary component in Saccharomyces growth, but it is not required for their fermentation. I do all my priming with table sugar for years, which actually gives you about 10% more carbonation ounce for ounce compared to corn sugar. I have had bottles from the batch which have been both over and under carbonated, so it is pretty clearly a priming procedures issue. sounds like a great brew. did you put in the peppercorns whole, or grind them? The peppercorns were lightly crushed (I used the end of a rolling pin). It turned out to be a very tasty beer, with a few months in the bottle it has really dried out and gotten crisper.